Forming followers of Jesus who impact their world. We believe in one God, creator of all things, infinitely perfect, and eternally existing in three persons, Father, Son and Holy Spirit. We believe that Jesus Christ is true God and true man, having been conceived of the Holy Ghost and born of the Virgin Mary. He died on the cross as a sacrifice for our sins according to the Scriptures. Further, He arose bodily from the dead, ascended into heaven, where, at the right hand of the majesty on high, He now is our High Priest and Advocate. We believe that the ministry of the Holy Spirit is to glorify the Lord Jesus Christ, and during this age convict men of sin, regenerate the believing sinner, indwell, guide, instruct, and empower the believer for godly living and service. We believe that the shed blood of Jesus Christ and His resurrection provide the only ground for the justification and salvation for all who believe, and that only such as receive Jesus Christ by faith are born of the Holy Spirit, and thus become the children of God. We believe in the personal, pre-millennial, and imminent return of our Lord Jesus Christ, and that this blessed hope has a vital bearing on the personal life and service of the believer. We believe in the bodily resurrection of all the dead; of the believer to everlasting blessedness and joy with his Lord, and of the unbeliever to judgment and everlasting, conscious punishment. We believe that the true church is composed of all such persons, who, through saving faith in Jesus Christ have been regenerated by the Holy Spirit and are united together in the body of Christ of which He is the head. We believe that water baptism by immersion and the Lord’s Supper are institutions of God to be observed by the believers in the local churches during this age to express their relationship with Jesus Christ. They are, however, not to be regarded as a means of salvation. Journey Church, Clinton, Iowa is a member of the Evangelical Free Church of America, an association of autonomous churches. 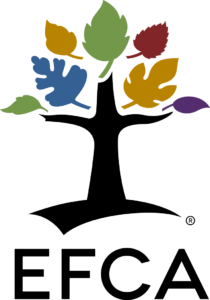 Learn more about the EFCA by visiting their website at efca.org. The Lord’s Supper (also called communion) is observed here at Journey Church on the first Sunday of each month. The Ushers serve the Lord’s Supper during the worship service, and all are welcome to observe the Lord’s Supper if they are a professing Christian. Baptisms are administered semi-annually and take place during the worship service. It is at this time that a Christian makes a public profession of their faith in Jesus Christ. If you are a Christian and have not been baptized as a public profession of your faith in Jesus Christ, we encourage you to take this important next step. If you have any questions feel free to email one of our pastors or give us a call at 563-243-4164.